I’M DEFINITELY REPRESENTED BY THE BEST. HE WAS THE WARRIOR ON MY BEHALF. NOBODY REPRESENTS YOU WITH MORE ENERGY AND DEDICATION. I DID NOT JUST HAVE A LAWYER. I HAD A GOOD FRIEND BESIDE ME. ONCE WE WON THE LAWSUIT, I WAS OVERJOYED. Mr. Weissman came to my house, personally, following my car accident and handled all aspects of the case himself, without having to go thru a paralegal at any point. I initially interviewed him because of his credentials I saw online but selected him after talking with him about his willingness to go to court, if needed, and not just settle the case. Also he assured me he would be reachable when needed which he always was. That is saying a lot. He was friendly and confident and always repeated any information I didn’t understand with a good attitude. He always showed empathy for the suffering I went through and he kept me clearly informed each step of the way on my case. I could in no way have been able to represent my own legal interests without a good lawyer like Mr. Weissman and I am very satisfied with the outcome of my case. – R.
David Raybin performed a valuable service to me upon my return from Iraq. I have recommended him to several friends and all report being very satisfied and grateful for his assistance. He is considered by the legal community and the media as a legal scholar and subject matter expert in criminal and civil law. A review of his many cases will reveal many high profile successful outcomes. I recommend him wholeheartedly to anyone needing legal counsel. Competent, professional, aggressive, and brilliant best of the best. Mr Raybin is the very best attorney one could hope for. He was attentive, responsive, knowledgeable, thoughtful and effective. We could not have been in better hands and have enormous respect for him. K. K.
Thank you for everything! Those are just words and don’t come close to how I truly feel regarding how you’ve handled this case. I know that what I’ve paid doesn’t come close to the time you’ve invested in this case and my family and I will be forever indebted to you. Again, thank you! I am overwhelmed with the professionalism and the zealousness with which you [David and Ben Raybin] helped my son. An amazing job all around! My family is forever indebted. To Dave Weissman: You are a fantastic attorney — not just for your legal skill, but your people skills as well and the ability to understand and adapt to the different styles of client you take on. Not everyone has that flexibility in this business and that is your gift and what sets you apart with excellence. As the relative of a mentally ill young person who was thrust into the Tennessee Criminal Justice system, I cannot overstate the gratitude we feel for Mr. David Raybin for guiding us to an optimum outcome. The charges and potential penalties at issue were too important to entrust to any attorney but the very best, and we feel fortunate to have had Mr. Raybin on our side. Going in, we were scared silly, completely naive, and clueless as to what we were facing, as I suspect most folks would be. We had lots of questions! Mr. Raybin kept us completely informed every step of the way and was always accessible. Of course he is certainly knowledgeable, but he also never failed to be gracious and understanding in dealing with some tough psychological issues. From my family’s perspective, he went well above and beyond our expectations. We knew going in of his sterling reputation, and we now know it is well-deserved. To anyone finding themselves in similar circumstances, I highly recommend him. A.A.
Mr. Ben Raybin worked extremely diligently on my behalf for a criminal defense case. He was very communicative throughout the preparation for our appearance in front of the District Attorney at the Davidson County General Sessions Court. Ben made sure I was fully prepared for our appearance by informing me of the process that would occur step-by-step and ensuring I had the proper credentials to guarantee the best possible outcome for my situation. I could not be more thankful for him, his efforts, and his dedication to me. Ben viewed my situation as one that was truly important to him and I am forever grateful for his service. I want to thank you again for all your help and support with my case. Your expertise and consummate professionalism not only helped me get the best possible outcome, they were also a source of strength that helped me and my family through a very traumatic time. Your reputation as “the best” is well earned, and I will recommend you without hesitation. When you took me as your client, I knew that I would never really be able to repay you for what you did for me. I knew I wouldn’t have much after all the bills, so I saved up all the loose change all this time so that I could at least give you something. I made it myself, so I hope you like it. It’s not much, but I did my best. My parents and I appreciate what you did more than you’ll ever know. And not only are you the best lawyer, but you gave me a great reference for a job. I can start again, without all the medical bills over my head. I won’t have to worry about my parents being sued by the bills, and if we’d be able to eat that month because we had nothing left. You gave us life (before all the surgery and pain) back, too. Ben Raybin is a phenomenal lawyer. I was down in Nashville for a Bachelor party and got jammed up pretty bad. I saw my life flashing before my eyes – everything I had worked so hard for was suddenly in jeopardy after making 1 horrible mistake. The worst part of being arrested is not feeling in control of the situation. Ben Raybin was professional and continuously worked to keep me informed of what was happening with my case. After hiring Ben, I felt at ease knowing that I had solid representation who I knew had my best interests at heart. 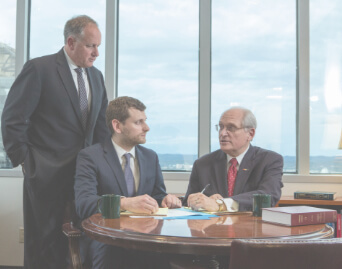 As a defendant, hiring the best lawyer can make or break your case. I’m glad I choose Ben Raybin- he saved my life. To the Firm of Raybin & Weissman: We recently concluded a lawsuit that was handled by Dave Weissman. We were very nervous through the whole litigation. A bad result could have destroyed what took us a lifetime of hard work to earn. Dave very professionally represented us and was able to convince a jury to rule in our favor. We know you are the best. A. & L.
David [Raybin], Thank you for returning my phone call so promptly this afternoon. I really appreciate our conversation. Thank you for candidly explaining this process to me and for building up my confidence in the system and in you. K.F. David [Raybin], I wanted to thank you again for everything you did in representing me today. Even now, I’m still realizing just how blessed I am at this “second chance” which you made possible for me. I sincerely appreciate you taking my case. I also was grateful that you stayed with me to the very end of the probation procedure, which I noticed none of the other attorneys doing for their clients. Thank you, L.P.
Dear David [Raybin], I simply cannot thank you enough for what you have done for the D. family. Your expertise was beyond more than any of us could have hoped for, but more than that your patience, effort and friendship helped take us all over a very dark period in our lives. J.D. Dear Mr. Raybin, Thank you for your assistance during our recent difficulties in Nashville. Your very timely and reassuring response was a great source of comfort to us and within a very short time, your promise that “we (would) get through this,” seemed possible. I particularly appreciate your sound guidance both regarding the cause of action to take with Vanderbilt as well as how to deal with J. Yours was truly the voice of reason and I can’t tell you how appreciative I am to have had the benefit of your counsel. S.T. Dear David [Raybin], David, David, David, what can I say except thank you so very much for your input in gaining my release November 3. I want to drop by for a few minutes upon my release to say hello and thank you in person. I have a very good friend coming up for parole in January that’s interested in hiring you. Again, thank you and my family thinks you’re the greatest thing since sliced bread. E.D. Dear Mr. Raybin, Again, I cannot thank you enough for the courage, care, and concern for all of us in the W. family. Dear Mr. Raybin, My Husband and I would like to take this opportunity to thank you formally for representing him at his parole hearing on June 6th. The care and concern evident by you makes us realize we live in a society where one can make a mistake but guidance and support changes our lives and we deserve the right to prove ourselves. Respectfully yours, P.E. Dear David [Raybin], I just wanted to take this opportunity to thank you for all of your help. This has been one of the most trying times of me and my family’s life. Your concern, legal abilities and kindness are greatly appreciated. R.S. Dear David [Raybin], You are an inspiring man. I cannot say how much your fighting for us has meant to me, to C., and especially to J. No one who even knows you will be a loser. We were able to fight with you and Jackie, to know your wisdom, courage, and compassion; to feel your balanced hope and compromise. We would never have received any question from the system without you and we are so thankful for you help and for standing with us and for us. I understand that this is your favorite wine so please celebrate. Thank you, S.J. Dear David [Raybin], You really came to my family’s rescue at a time that was crucial to both her well-being and that of ours. We are grateful for your dedication to helping those of us who call upon you in these serious times. I believe that you can do what you say you can, as long as you have the cooperation of those that are being helped. Now, about that walking on water . . . just how DO you do that? V.J. Dear Mr. Raybin, I just wanted to let you know how thankful I am for the work you did on my case. I know that in the general scheme of things, my case was probably pretty small compared to other deals you work on, but the time you gave to it was just the right amount to fix things up. I am indebted to you, as are my mother and father. I think it is more than safe to say that I have learned my lesson and I will be sure to keep my nose clean from here on out. I hope your holiday season isn’t to busy. Have a wonderful Christmas and New Year. Thank you. J.V. Dear Friend, [David Raybin], Please know my great and sincere appreciation for your time spent with me regarding my son, E. Your knowledge, skill and integrity are wonderful companions with your compassion. Our Lord be with you always in all ways. R.S. David [Raybin] There aren’t enough words for me to express how much T. and I thank you for everything you did and have done for us. I know in my heart that my son wouldn’t be here today if you hadn’t done all that you did and I thank you from the bottom of my heart. We will never forget all the wonderful things you did for us, all of your hard work, your time and all of your efforts. You are a lawyer God sent to us, you are such a wonderful man and we have been very blessed to have met you and to have had you in our corner helping us, and because of all of your help and efforts. T. is with me today and I take case and God Bless. S.T. Dear Mr. Raybin, Thank you, thank you, thank you! I am keenly aware that in the “big picture” of your practice, I am just a tiny speck, but I need you to know that you’ll never have a more grateful client. You saved my life. I really can’t imagine what it would have been like to have the children who trust me – and have trusted me through the years – hearing the horrible garbage about me on the news. I have no doubt that you would have fought for me and proved my innocence, but by then the damage would have been done. Please add my thanks to your mother for teaching you to read!! Gratefully, A.G.
Dear David [Raybin], You’ll never know how much your support meant to us! I know exactly why you are listed on “The Best 100 Lawyers in America” . . . God put you there!!! You’re the best and your purpose is BIG!!! B.H. Dear Mr. Raybin, Thank you for taking the time out of your busy schedule and such short notice to provide me with council. Your encouragement and advice helped me through the hearing. I appreciate everything that you have done to help me. Enclosed is the check to pay for your services. Thank you again! Sincerely, J.Y. Dear David [Weissman]; This letter comes as an expression of our sincere appreciation for your successful legal representation throughout my wife’s recent slip and fall case. After her injury and subsequent surgery, when it became obvious that she would have to file suit in order to recover damages I was very concerned that my wife’s lack of experience in our legal system coupled with her natural desire to please others might make her vulnerable as a witness and therefore might be exploited by the opposing parties. Her pre-existing back problems and other medical issues were such that I was also fearful that winning the case could be difficult. We interviewed other attorneys but chose you not only because of your extensive experience with slip and fall cases, but also due to your in-depth knowledge of the medical aspects of her injury. During our initial meeting you impressed us as a true expert in your area of practice and a highly ethical lawyer. We sensed that you would genuinely hold her best interests at heart throughout the case. The outcome of the case proved to us that we chose the right attorney. I especially want to thank you for taking the time to meet with us on a regular basis throughout the case in order to keep us informed of developments. Doing so afforded my wife a great deal of peace of mind. As our settlement reflects, you were able to evaluate the nuances of the case in order to anticipate and deal with potential weaknesses. David, you have made a difference in our lives and for that, we will always be profoundly thankful. Warm Personal Regards, M. and B. T.
Dear David [Raybin], I writing you this card to let you know how much I appreciate all that you are doing for me. When I have a problem you are right there for me. I want you to know you are my rock. I believe strongly in your ability as a lawyer and I look forward to going to trial so I can see you do your thing. I hope you have a bless day. D.D. Dear David [Raybin], W. and I want to thank you for representing our son-in-law R.G. in Montgomery County Court on October 20, in Clarksville. You did a great job and we appreciate the fact that you worked out a retirement of charges with nothing showing up on his record. We had not realized this was possible. We appreciate what you did beyond words. R.H. HUGE THANKS TO YOU, DAVID [Weissman] ! David, this was really beyond our hopes. We cannot begin to express our appreciation for your professional judgment and guidance. Once again, we are in your debt. If ever there is even some tiny thing we can do to assist in making your life better, please provide us with the opportunity. Attorney David Weissman really helped me and my mother understand our rights and provided legal advice in regards to my case. As a teen developing into a young lady, I have never been so empowered and it was because of Mr Weissman. We never felt like we were just a case. They made sure we felt like we were apart of their family and I will forever remember that. I highly recommended this legal group and will forever be appreciative for what they did for me.